A simple air cooled pot still for making distilled water, essential oils and, where legal, alcohol. It is also known as a Smart Still. This item is exempt from our Free Delivery offer. Please read the full description for details. Please Note: This item is exempt from our Free Carriage offer. Its price varies depending on the delivery destination, but the price quoted covers the carriage of everything else ordered and shipped at the same time. This superb stainless steel air cooled "pot still" is perfect for use in the home distillation of water, essential oils and, where legal, alcohol. 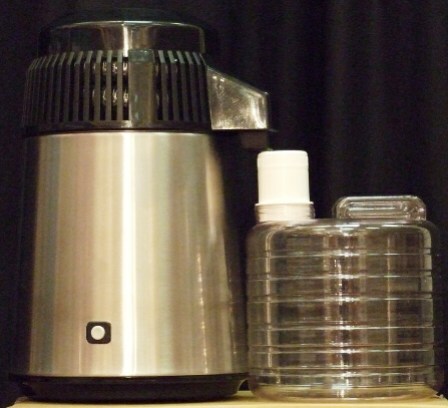 It has a working capacity of 4 litres and, when distilling water, needs approximately 2 hours to heat up and then a further 2 hours to produce clean, demineralised, distilled water for use in irons, kettles and topping up car or forklift truck batteries. When making alcohol (where legal) it will heat up in approximately 45-55 minutes and will produce 650-850ml of 65% spirit (depending upon the strength of the base wash) in around 45 minutes. It is supplied complete with the collector system, but a second collector filter system may prove useful as it will dramatically speed up the filtration process. 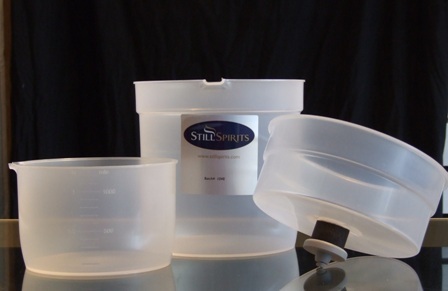 The item shown here is the version marketed by Still Spirits and is known as the "Air Still". Hambleton Bard also market this item under the name "Smart Still". The basic still is identical and operates in the same way as the one shown here. The main difference between the two is the collector system used in each. 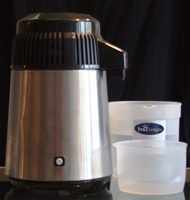 The Air Still uses the collection jug shown in this picture and the contents are then filtered using a carbon block. Mix 6-8kgs of granulated sugar (or as specified by your yeast) in a few litres of freshly boiled water. Stir until dissolved and in the form of a rich syrup and then top up to 23 litres with water, adjusting the mixture of hot and cold water used to achieve a stable temperature of around 20-24°C. Mix in a sachet of activated carbon (also known as activated charcoal) and add a sachet of Turbo Yeast. The resulting mixture will be a dirty black colour, but the carbon will absorb most of the unpleasant compounds produced during the rapid fermentation and will be removed later in the process. Ferment as per the instructions provided with yeast. This can take between 1 and 5 days depending upon the type of yeast and amount of sugar used. If home distillation of spirits is illegal in your home country (as it is in the UK), you can use this fermented wash, which is likely to be between 14-20% ABV, as a base for mixing with the various liqueur and spirit essences that are available. If home distillation is permitted in your home country, transfer 4 litres of this wash into your still and add some ceramic raschig rings and some Distillers Conditioner to act as a boil conditioner and prevent the wash from boiling over. Place the smaller clear plastic collection jug underneath the still outlet spout. Turn on your still and leave to heat up for about an hour. Once the correct temperature is reached, the alcohol will start to distil out, begin to condense in the air cooled tubes in the still cap and will start to drip through the filter chamber into the collection jug. Depending upon which yeast is used in the initial fermentation, it MAY be necessary to dispose of the first 15-25ml produced as these may contain some of the less pleasant tasting flavour compounds. With the yeasts sold specifically for making up a Sugar Wash to be used in an Air Still, this is unnecessary according to the Still Manufacturers. Once you have collected around 650ml, you will probably find that, depending upon the original alcohol strength of the wash, that you may have neat alcohol at a strength of around 60% ABV. This will need to be watered down to "usable strength" prior to using it as a base for mixing into liqueur or spirit essences. 325ml of clean water added to the original 650ml will result in 975ml of home made spirits at an ABV of around 40%. If you use a yeast with a higher alcohol tolerance, more of the 60% alcohol will be produced and you will need to add more water to get it down to “useable strength”. Pour this clean liquid through the carbon filter in the other part of the Filter/Collector system. This will clean the liquor and provide a smoother finish. It works best at alcohol concentrations below 50% ABV, which is why it is preferable to water down your high quality spirit prior to final filtration. Allow the still to cool down and then dispose of the remainder of the wash in the still. Add a further 4 litres and start the process again. Some home distillers recommend not watering down each primary batch of spirits and instead believe that a smoother, cleaner spirit can be produced by collecting ALL of the primary batches and re-distilling the whole lot. This will produce a distillate with an ABV of around (or possibly in excess of) 80%, but with a much reduced volume. To a large extent, it is really a matter of personal preference. I would re-iterate that home distillation of spirits is ILLEGAL in the UK, even for home/personal use. These instructions for producing spirits using a home still are provided purely for information purposes only and should not be followed within the UK.